The story opens in New Zealand, where a one-eyed menace from the stars has landed and, only ten minutes later, killed 15,000 people. Superman, after being debriefed by the military task force, attempted to ram the creature, only to find it had a gellatinous composition. Telepathically, the monster spoke to the Man of Steel as it grabbed and swallowed him, where Superman found all of the missing people with tentacles attached to them. The creature called itself Memnon, and claimed to sustain itself off of the memories of others...both hereditary and conscious...which proves fatal to the victims. Humans so far had proved too temporary a resource, but after sensing the energy in Superman, Memnon claimed him as his main course. In a state of suspended animation, Superman is introduced to memories he had never known, dating back 500, 000 years ago on the planet Krypton. It is the end of the Golden Age, where there once existed men with God-like powers and now the lands were barren and desert-like. In these wastelands dwelled a young boy named El, and his adopted parents, Naton and Mar. El was apparently found by the couple in the desert and thanked their god, Rao, for answering their prayers for a child. El has very little interest in Rao, but still believes in him. One day, when on a hunt for food, Naton and his son are attacked by soldiers of Lord Utor, the self-proclaimed new god of Krypton. Naton orders El back to their village for reinforcements, but when he sees his father wounded and at the mercy of a soldier named Dar Lilit, he disobeys and lands a strong blow on Latil...and kills him. Temporarily startled by this boy's fantastic strength, another soldier (Kolat) tries his luck, resulting in both of them falling off the cliffs to their doom. Naton crawls back to the village for help. While Utor and his right-hand man Brutas (Kolat's brother), is informed by his soldiers of the demise of his favored men, the people of El's village take his body to the Temple of Rao for last rights. Oddly, the priests forbid him entering the temple because of a scar on his chest resembling the mark of Rao, and a self-inflicted mark is sacrilige. Suddenly, a flame engulfs El's body, and he vanishes. The priests claim that Rao has taken him, claimed him, but El will be returned to lead the people. El himself, meanwhile, is presented with a vision of the red skull of Rao, who explains the history of Krypton to him. Before his time, there had been men of vast powers, but although they forged the Golden Age, they also became too proud and destroyed themselves. Rao grants El the power to change things for the better, but only as long as he does not become proud by his power. El then finds himself in a tomb, and shatters the stone lid with one punch. Remembering that the mark of Rao is really a scar he recieved when he went off the side of the cliff, he does not believe he is the chosen. Back on Krypton, Utor vows retribution for the loss of his best soldiers and orders the Wastelanders, as they're called, dead. In the battle, Naton is brutally murdered. Consumed with revenge, El joins the fight and brutally slaughters most of the men. The soldiers flee, leaving El with much to think on, especially with the priest Zoltar who continuously preaches that he is Rao's chosen. For their cowardice, Utor orders all of the men from the fight decapitated, then remembers that Dar Lilit had an enchanting daughter who hates the boy with a passion. He decrees that he will arrange a marriage. Meanwhile, El is in mourning for his father at the Temple when a beggar comes asking for his help, claiming a hungry worm is terrorizing his community. To El's horror, he discovers not only the worm itself, but that the people have selected a beautiful red-haired girl as one of their many sacrifices. The woman is swallowed, but El climbs in after her and guts the worm from the inside during his escape with the girl unharmed. He is flattered when he learns she, and others, believe him to be a god. Time passes, and El uses his great strength to defend the helpless from invaders, plow the toughest soil for harvests, dig water sources, etc...all the while becoming clouded with pride. One day, on one of his many disagreements on the existence of Rao with Zoltar, El and the priest come across a blonde woman being hunted by Utor's soldiers. With a tree, El easily overpowers them and saves her life. Taking her back to the temple, he learns that her name is Laras, and she is a Wastelander like he, though she was born in Utor's city. El is instantly drawn to her. El and Laris are engaged to be married, much to the disdain of Zoltar and El's mother, who has her suspicions about Laris. She is proven right, because Laris is, in fact, the daughter of Dar Lilit, sent by Utor to help destroy El. Although a spy of Utor's believes she is being seduced herself, she reaffirms her vow of revenge. The pair are wedded, and time passes. Zoltar becomes enraged at how El has strayed from the path that Rao had meant for him, but El accuses him of jealousy born from the fact that the people come to him for help instead of Rao. Although Mar agrees with El, she is ashamed that her son would physically assault an old priest. That night, El recounts that day in the temple when he became empowered, and that he remembered green stones beneath the temple that hurt him. Although Laris promises not to tell anyone, she betrays that trust and, the next day, Utor's men raid and destroy the Temple of Rao, taking with them the green stones. El gets word of the mass-murder, among them Zoltar, and decides to take the fight to Utor himself. It is outside the gates when Laris reveals her true nature and puts a collar over her husband, which is made from the very green stones that made him weak. El is then put through a weak of torture, from the breaking of his fingers to permanent blindness. However, while Utor gloats, Laris says nothing, disgusted with the torture of her husband. She is then sent by Utor down to the dungeon to tell him if he admits that Utor is the one true god, he will have a swift death. In her presence, El finally confesses his sins and submits to the will of Rao. To his eyes alone, Rao appears and tells him to accept Utor's offer, and no harm shall come to his unborn son, who will one day become a great leader. Brutas, also present, claims to have seen the same thing, and runs in terror at the things he had done. As an act of mercy and guilt, Laris unshackles El to allow them one last night a s man and wife. Before the masses, a blinded El is brought before Utor's court. Utor does not buy the ease in which El submits to him, and orders Brutas to put El between two columns called The Pillars of Truth for "baptism." It is there where the same energy that gave El power flowed from the city's foundations and renewed El's might. Snapping his chains, he is protected by Brutas who throws himself in the line of arrow fire. El topples the pillars, which begins a chain reaction that destroys he entire city...with him and Utor with it. The inhabitants fleed to the wastelands, Laris included. But Mar, who now sees Laris's good heart, offers to take her and her unborn baby in after seeing a vision. In this vision, she forsaw El's descendants bringing peace to Krypton and to other words years later. Together, they join as family to found the House of El. Story - 4: All in all, Grant and Kane made a superb collaboration on this book. To have an alien entity feed on hereditary memories of living creatures was a brilliant strategy to link the present-day Man of Steel to the past "man of might" as El was called. However, my one complaint was the names of some of the characters. "Utor" sounded too much like Luthor, and El's parents "Naton" and "Mar" sounds like Jonathan and Martha. And finally, Laris seems too similar to Jor-El's wife, Lara. I know the point was to establish a link with Kal-El, but there's a certain point where it starts to sound silly. However, thankfully, they stopped three steps shy of that line. I think having El die and come back empowered drew upon religious subtext (ie, Jesus rising from the dead), which was not a bad thing since many Superman historians draw the same connections between Clark and Moses. And finally, the initial appearance of Rao as a giant floating head seemed oddly reminiscent of Marlon Brando's Jor -El in "Superman: The Movie," especially with him beginning his soliloquoy with "My son." In spite of such in-jokes, the story worked. Congrats to Grant and Kane (God - and Rao - rest his soul). Art - 5: I know some of you may think I'm giving Gil Kane and John Buscema's art a top score because it's the last published work from these two, but that's far from the truth. I first learned how to draw from the book Buscema wrote with Stan Lee ("How to Draw Comics The Marvel Way"), and Kane drew the Gwen Stacy death story in Spider-Man. I feel honored to have this opportunity to critique their work, but my objectivity remains nonetheless. The character design of El definitely has the family resemblance, yet somehow seems an amalgam of Superman and Conan the Barbarian, a noted Buscema character. However, since it is a dystopian world, I'll let that one slide. Kane and Buscema seems so alike in their pencils in this book that it's often hard to tell them apart, which is a good thing; the story wouldn't have had the same flow if the characters looked different in proportion and detail. Neither Kane nor Buscema had lost their touch at drawing women near the end. Laris was definitely a woman that any guy would fall for, especially me. (I'm a sucker for blondes sometimes. Sue me.) Also, the mark of Rao on El's chest seemed like a nod to the Kryptonian "S" on Tom Welling's chest on "Smallville". Whether or not it was intentional, it definitely brings up some interesting possible connections between comic and TV versions of Superman. Speaking of Big Blue, his look is great, save for the spit curl. It's usually another hidden "S" artists draw, but I guess John and Gil were trying to get away from that motif. All in all, it was a great final piece by two of the industry's best known artists. Rest in peace, guys... and thanks. Cover Art - 5: A truly powerful shot. 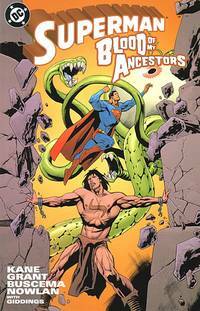 It also hints that the story of Superman vs. Memnon and the rise of El are two separate stories. And how the fight is placed in the background instead of the foreground hints that Superman takes a backseat in this issue. Again, great work, Kane and Buscema.